Sometimes when we bring a senior dog into our care, we find out they have a life threatening medical condition. For some of our dogs who are expected to live only a few months, we provide Hospice Care. 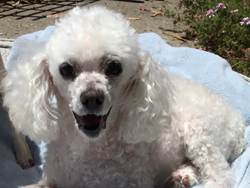 Providing Hospice Care for a dog is a big commitment and a rewarding experience. If you are interested in providing foster care for a dog for the last several months or more of their life, contact us. 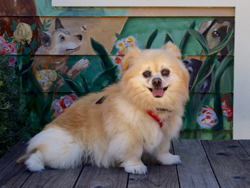 As with all foster assignments, POMDR will cover all medical expenses for dogs in hospice care. Please consider becoming a sponsor for one of these sweeties. Goliath is precious and sweet. He keep his foster family laughing. Goliath came from a very loving home. His family fell on hard times and could no longer keep him. Goliath has degenerative disease in his back and it is touch and go some days. He may eventually be completely paralyzed. We have been managing his condition with medication and mobility restriction and that helps. He is being fostered by a veterinary ICU nurse and her retired uncle, so he is in very good hands and will stay in their care for the rest of his life. Please consider sponsoring Goliath's forever care. 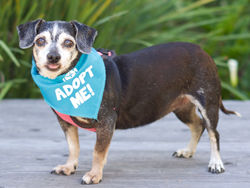 Gurdy is a 12-year-old, small mixed breed. She is a fantastic little lady who is gentle and amazing with everyone. She is great with other dogs and a wonderful lap companion. Gurdy is having trouble walking even though she is on multiple pain medications. Her foster is keeping in close contact with the veterinarian to evaluate Gurdy's needs. She is also blind and it was decided the best option is to have her stay in her familiar foster home where she can continue to receive great care. Gurdy was rescued by good Samaritans who found her as a matted stray. They helped her get cleaned up and find her way to POMDR. Please consider sponsoring Gurdy's forever care. Jenny came to us as a stray from Monterey County Animal Services. After five months in foster care, she was diagnosed with a life-threatening inoperable cancer. Jenny will spend the rest of her time in the loving care of her foster dad. 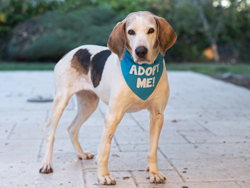 Jenny is absolutely sweet, gentle and an affectionate companion. She is house trained, quiet, and wants nothing more than a comfy place to be and a person's presence. Jenny is a gem. Please consider sponsoring Jenny's forever care. This calm little lady is a gentle nestler. She isn't vocal and doesn't run around in excitement, mostly taking in everything with her tender brown eyes. She responds happily to treats and to affection. Tink came to us from the Salinas Animal Shelter after being picked up as a stray. Tink has been struggling with Cushings over the past year, and sadly it is now apparent that the disease has taken it's toll on her. She is in a loving foster home with an incredible foster that is keeping her comfortable, but the vet and foster agreed it'd be better for Tink to not move again in her life. Please consider sponsoring Tink's forever care.